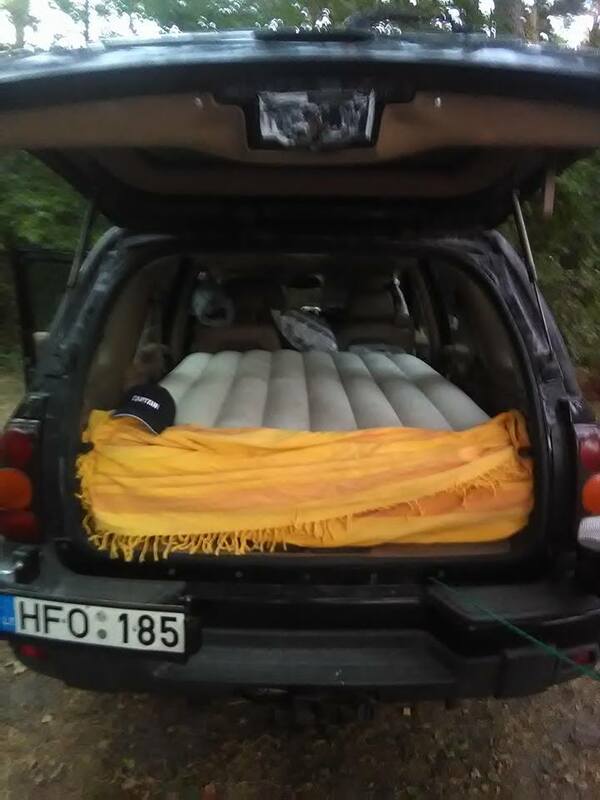 offroadTB.com • View topic - Has anyone slept in their blazer? Has anyone slept in their blazer? Has anyone slept in their blazer? How does a twin air mattress or cot fit? Any photos? Re: Has anyone slept in their blazer? I just kicked the passenger seatback all the way down and crashed out there. Mine was an EXT, so a foam or air mattress would probably have fit, but I'd have to move all the "stuff" in the back out and back in, and I'm usually too tired for that after a day in the woods. Up and down in 5 minutes. Adds a window with screen for air and a little more room to stretch. Lone_Wolf wrote: Has anyone slept in their blazer? How does a twin air mattress or cot fit? Any photos? Slept in it numerous times. I got a 42" wide 2" thick sleeping pad from Cabela's, I forget the length, but it fits perfectly in my SWB. I am 6'3" and I can stretch out diagonally, no issue. I have removed my rear seat headrests and I remove my rear seat bottoms when I know I am going to sleep inside. Search my posts on both subjects. I like the sleeping pad better than an air mattress as the air mattress doesn't provide any insulation and I would always get cold from the mattress. Looks comfy with that air mattress in there! The only time I've slept inside was at rest stops in the passenger seat reclined all the way back. Now I got the Rooftop tent for camping and occasional rest stop so no more passenger sleeping for me.